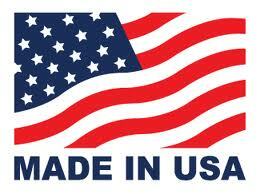 Fogazzo produces in California, two distinct series of wood fired ovens. 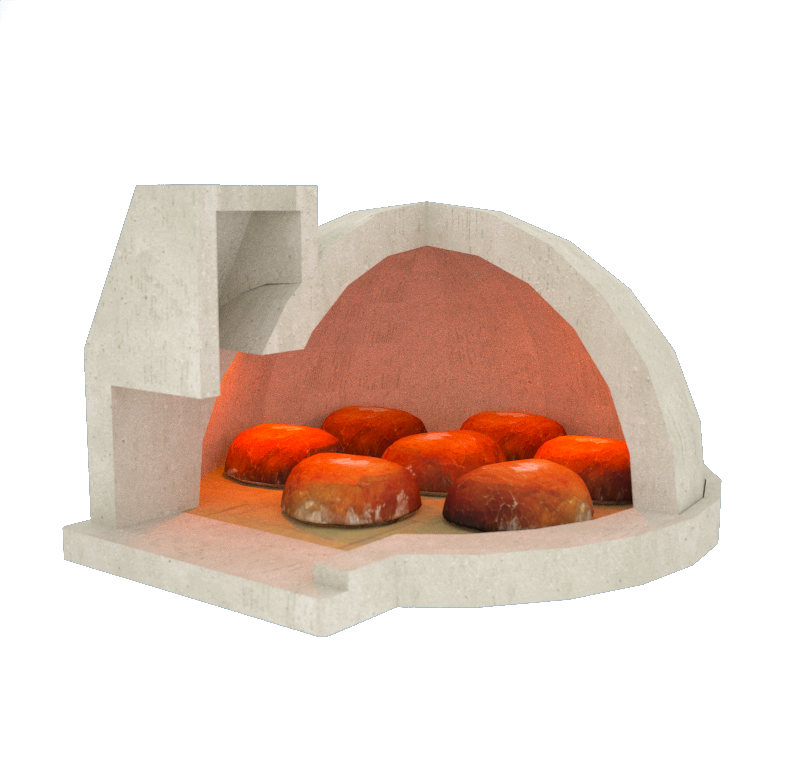 Our original ovens like the Model 850 and the Model 1050 are in the more traditional round shaped dome, which are also affectionally know as igloos, due to their very igloo like shape. 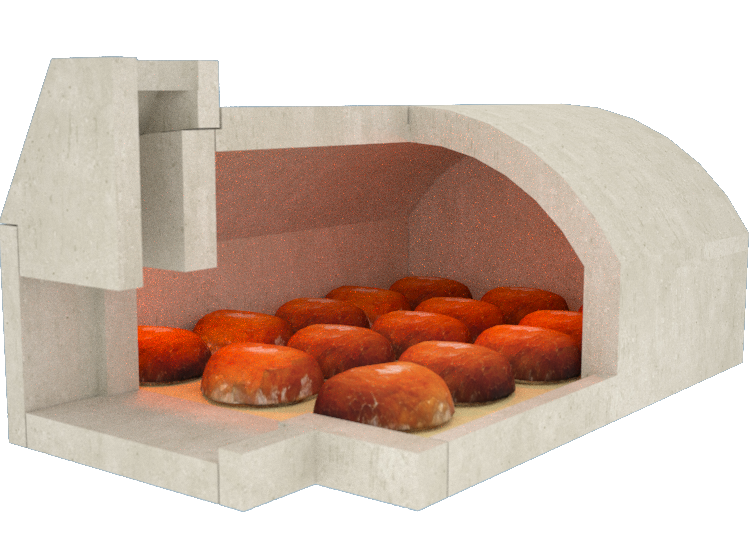 Our newer and patented “Treasure Chest Series Ovens”, like the Model 855, Model 955, and Model 1055, were developed to take advantage of the fact that a vast majority of all wood fired ovens are installed in a rectangular shaped structure, as shown below. This means that when a traditional igloo shaped oven is used, the inside corners, which could be useful as cooking space, are lost. In this page, we show how the “Treasure Chest Series Ovens” and the now traditional igloo shaped ovens, can be compared, when installed in the same space. The information contained herein is intended to help you to decide which oven series will best fit the particular requirements of your space, and your specific needs. We will begin by comparing the Models 850 and Model 855 which are very comparable in size and can be installed in virtually the same space as their external footprints are almost identical. 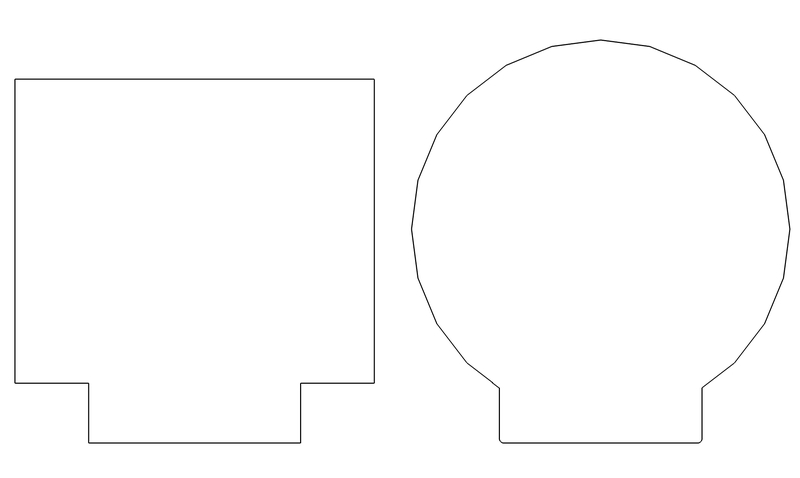 Model 855 on the left has a more retangular footprint and the Model 850 is round. Using a cutaway view, it becomes easy to see that although their external footprints are virtually identical, the Model 855 on the left, has substantially more internal volume. This “extra room” allows for the various foods, to fit more comfortably in its spacious cooking chamber. 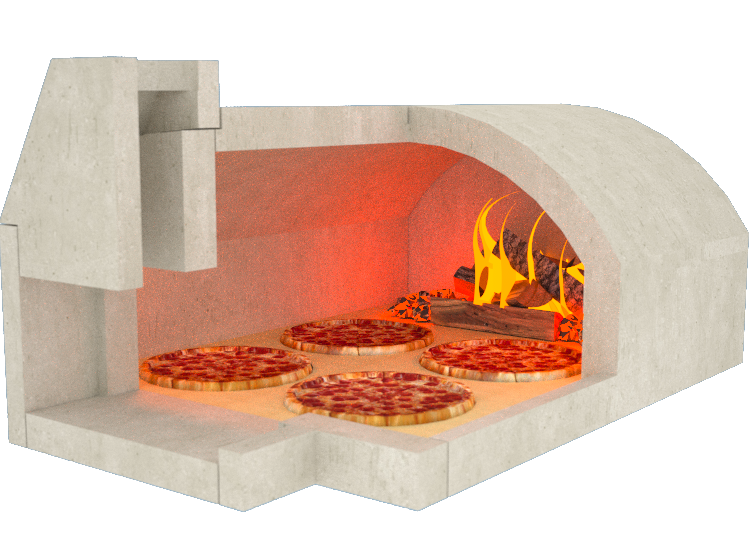 There is also a larger door opening in the Model 855 which allows for easier access and the placement of larger pizzas, pans, bread, etc, in the oven. The fire is the exact same size and in the same position, the two pizzas are 14” large pies. 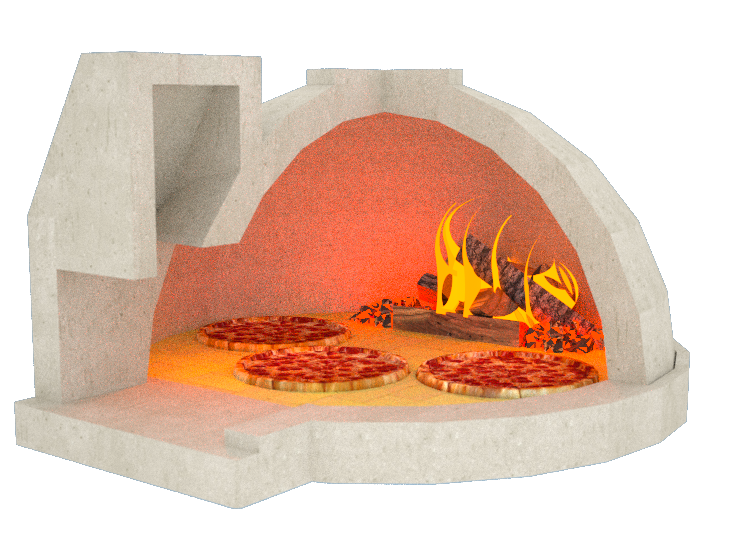 In the Model 855 on the left, the pizzas fit better with more room around and in between them, in the Model 850 the same pizzas have to be placed closer together. During retained heat cooking as used to cook bread, there is no fire in the oven, it is removed along with the ashes, etc. In this scenario, we can see that the Model 855 on the left can fit two more one pound rounds of bread, compared with the Model 850. In the case of roasting, it can be done with a small fire or no fire, just retained heat. 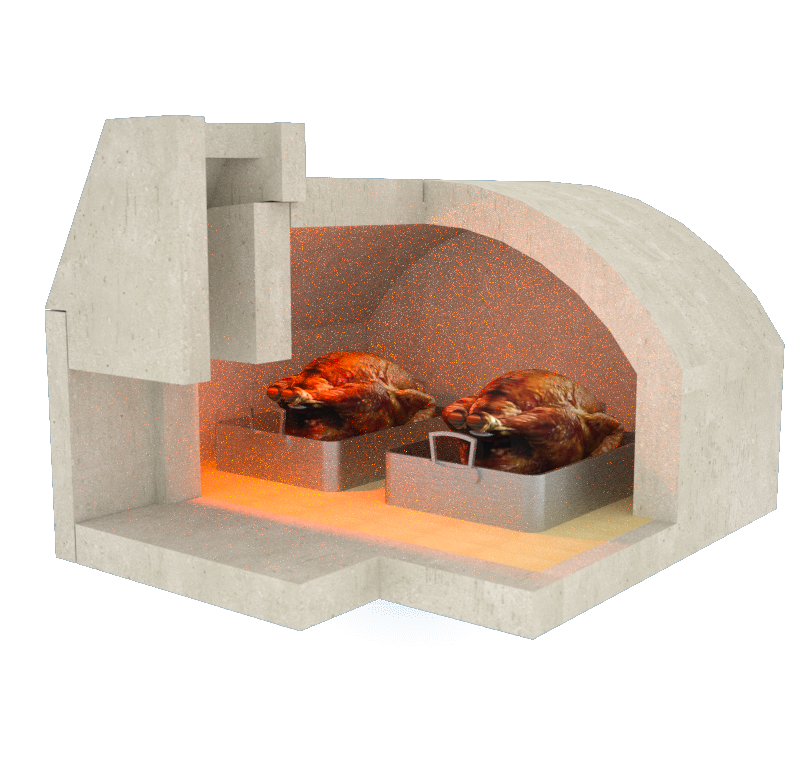 In either cast, the larger interior cooking chamber of the Model 855 on the left, can cook more food than the smaller space within the Model 850 on the right. 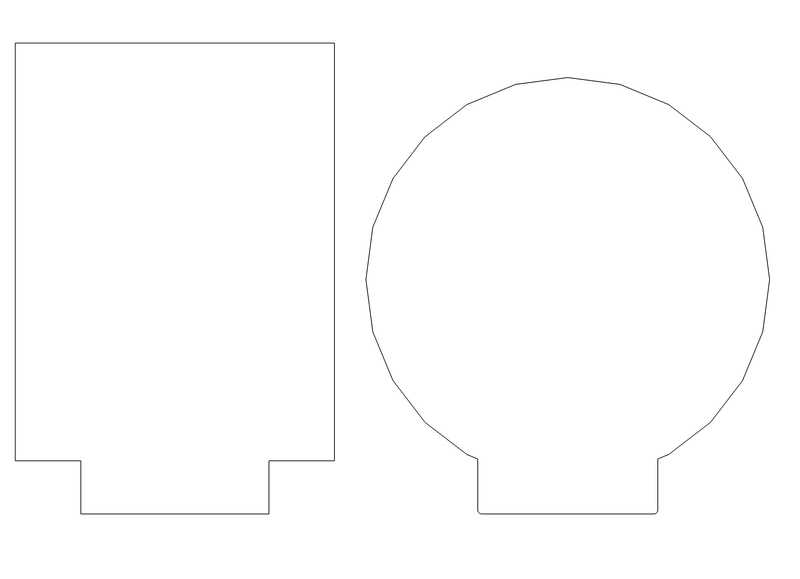 Model 1055 on the left has a more rectangular footprint and the Model 1050 is round. Using a cutaway view, it becomes easy to see that although their external footprints are very similar, the Model 1055 on the left, has substantially more internal volume. This “extra room” allows for the various foods, to fit more comfortably in its spacious cooking chamber. There is also a larger door opening in the Model 1055 which allows for easier access and the placement of larger pizzas, pans, bread, etc, in the oven. The fire is the exact same size and in the same position, all the pizzas are 14” large pies. In the Model 1055 on the left, the 4 pizzas fit better with more room around and in between them, in the Model 1050 only 3 pizzas can fit together, a reduction of 25%. 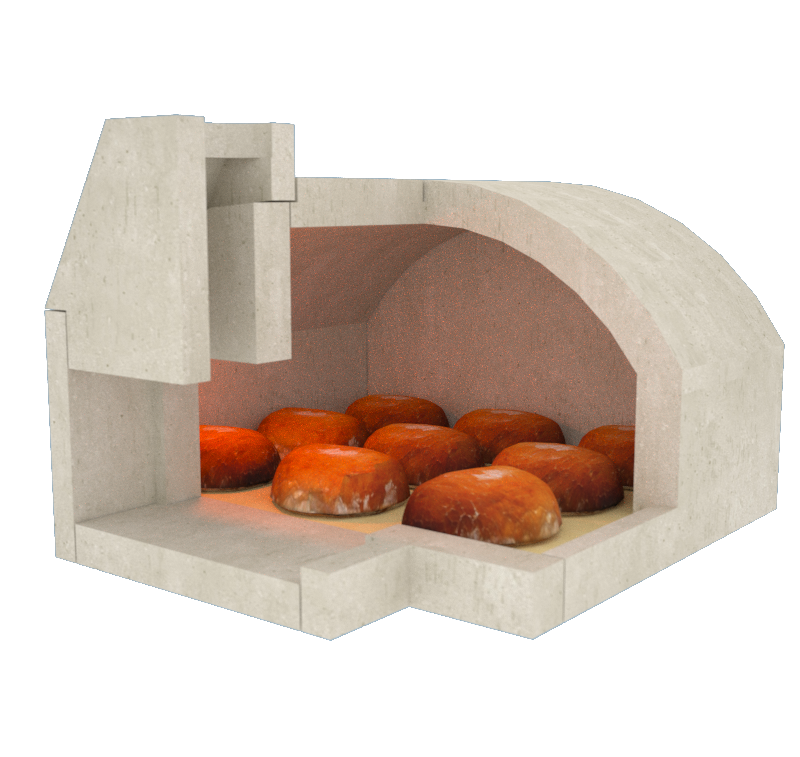 During retained heat cooking as used to cook bread, there is no fire in the oven, it is removed along with the ashes, etc. In this scenario, we can see that the Model 1055 on the left can fit three more one pound rounds of bread, compared with the Model 1050. In the case of roasting, it can be done with a small fire or no fire, just retained heat. 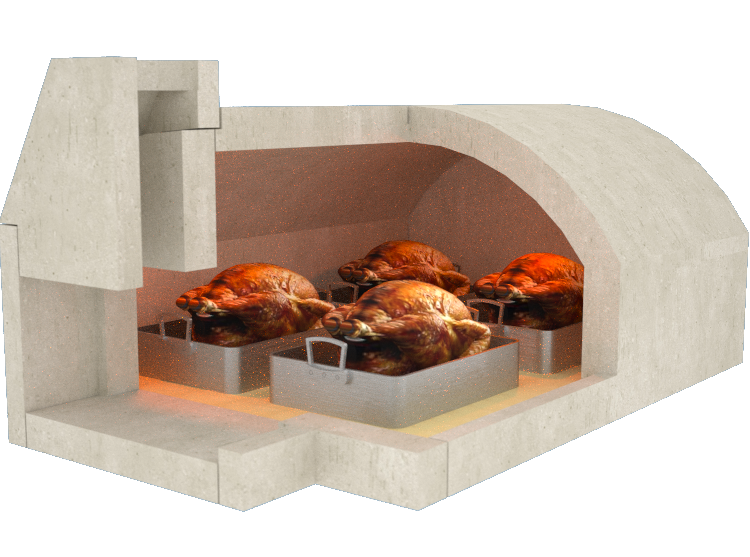 In either cast, the larger interior cooking chamber of the Model 1055 on the left, can cook more food than the smaller space within the Model 1050 on the right. 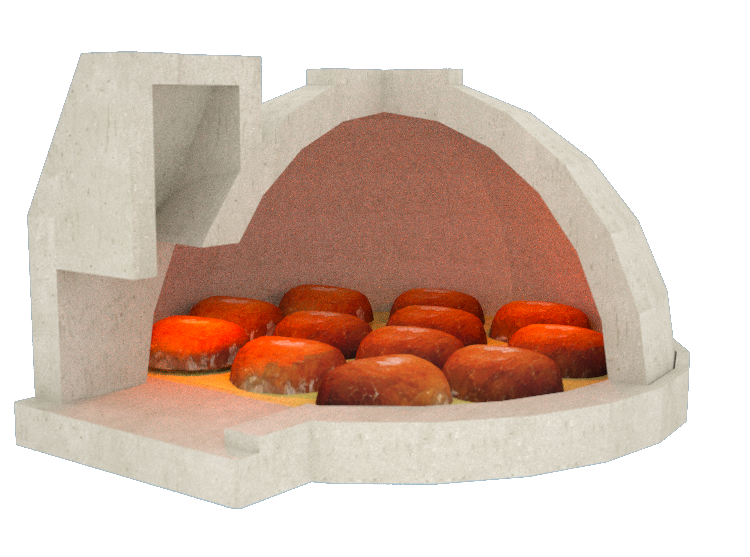 Please keep in mind that we are in no way trying to talk someone out of the purchase of a traditional round oven, we just believe that the “Treasure Chest Series Ovens” represent a step forward in the evolution of wood fired ovens. 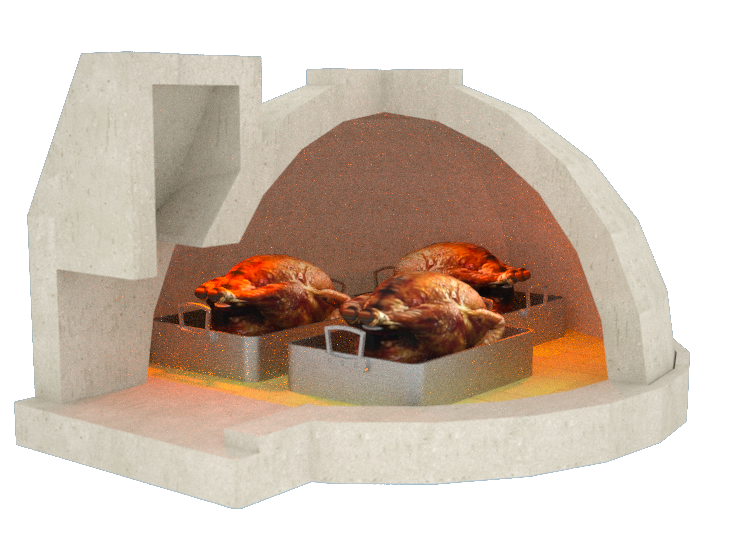 They were developed using our vast experience in both the production as well as the use of wood fired ovens over a lifetime. It is our belief that any of our ovens, barbecues, and fireplaces can be a beneficial addition to anyone’s home, outdoor kitchen, or mobile wood fired oven business. 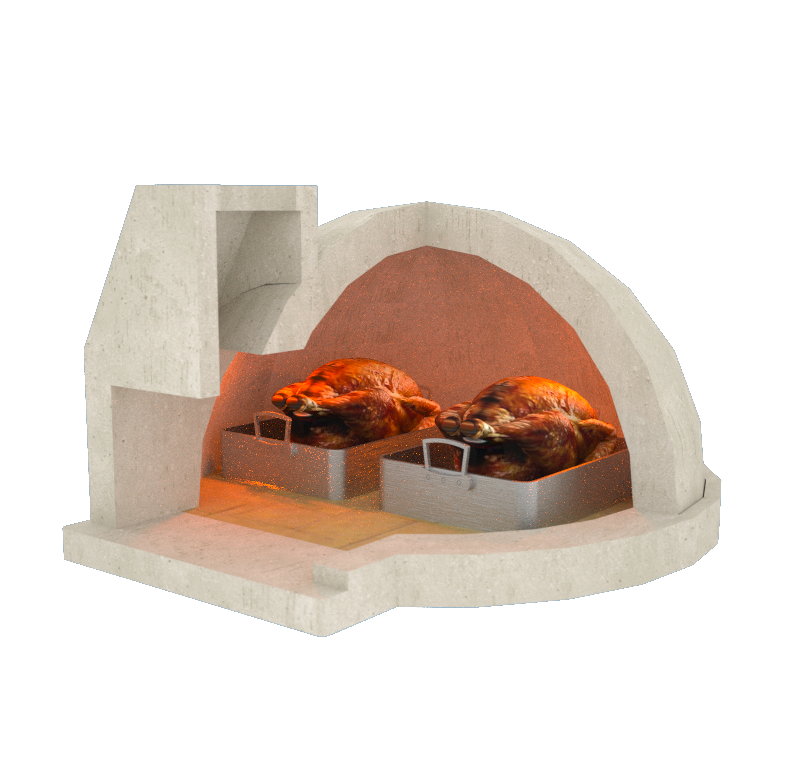 It is our intent to make the very best wood fired products in the industry, employing the best craftsman, and raw materials available, to produce only the highest quality products. From all of us here at Fogazzo, we would like to thank you for considering the purchase of one of our products, as we know that we really could not be here without you! Cheers!